Bigger than the Note but not as bright. Not saying anything. We wouldn't want to get this guy upset. So, careful with the F-word. And no, not phablet, obviously. Though at 8mm, the Samsung Galaxy Mega technically isn't fat. 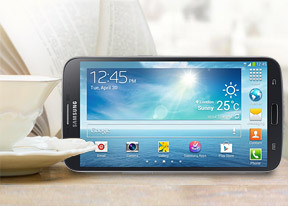 There has been no such thing as size limit for Samsung but is the Galaxy Mega 6.3 already pushing it too far? The massive 6.3" screen puts the bigger one of the Mega brothers well into the upper range of phablets and almost into tablet territory. The Samsung Galaxy Mega 6.3 - as in a 6.3" screen - is the bigger and better half of the Mega pair, making an interesting alternative to the Galaxy Note line of phablets. It's bigger than the first two (most likely bigger than even the Note III as well) but actually more affordable. There were of course some inevitable cuts, mainly in the display and chipset area, but the Mega 6.3 still boasts LTE connectivity, Android 4.2.2 with exclusive TouchWiz features like Multi-window and Air View among other goodies the Galaxy S4 has, including the IR remote control functionality. While the screen is less than stellar, 233ppi is better than what the Galaxy Grand got and on par with the Galaxy S III mini. It's the chipset we're more worried about - it's a better version of the one Nokia uses in the Lumia 520. Sure, the CPU runs at a much higher clockspeed (70% higher) and there's three times the amount of RAM, but the Galaxy Mega 6.3 will have to really bring its A game to get anyone impressed. On the other hand, the proprietary Multi-window feature really comes into its own here - the split screen gives each app nearly the same surface area (though not aspect ratio) as the display of a Galaxy S II. And you get premium goodies like the latest Android version available, Air View (detects your finger hovering above the screen and offers functionality similar to that of the S Pen), an IR remote control, LTE, Group Play and more. Recent smartphone history has seen plenty of too-big-to-use devices that were quick to prove doubters wrong. The Samsung Galaxy Mega 6.3 will raise a few eyebrows, but it has the potential to bring the phablet form factor to the masses, seeing how the Note II might be out of reach for some (which didn't stop it from selling by the millions). So how big is "big" anyway? The Mega 6.3 is ample for sure, but its dimensions aren't that scary - jump to the next page to find out how it feels in the hand and whether the screen is worth the extra bulk.